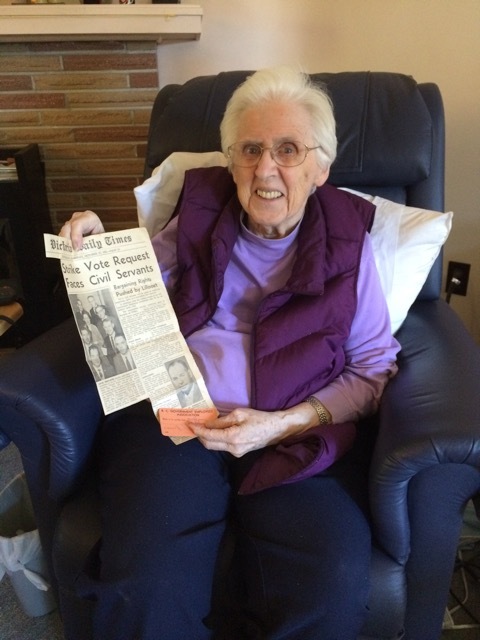 It's hard not to think of Joan Gower Gillatt as the first woman of the BCGEU. Not the first woman member, but our union's first woman trailblazer. Joan passed away on August 10, 2017 in Duncan. She was 93. Duncan United Church, 246 Ingram Street, Duncan, B.C. Joan's was a life of community service and activism, beginning with her work in the labour movement. She was a lab assistant in Victoria when she joined the B.C. Government Employees' Association (which later became the BCGEU) in 1944. Joan became the Victoria branch's vice president, then president and later joined the BCGEA's provincial executive. Over the years, Joan took on the many anti-worker policies of WAC Bennett's Social Credit Government. As the provincial executive's only woman member, she led the battle against a discriminatory rule forcing women in the public service to retire five years earlier than men. Joan was the BCGEA's elected vice president in 1957 when the president died, making her the association's first woman president. In 1997, the BCGEU granted Joan a well-deserved special life membership. After leaving the labour movement to teach high school in Duncan, Joan became an active member of her community. She served as an elected school board trustee and municipal council member over two decades. In recent years, Joan has lead the Cowichan Peace Pole Art Project, which would see the creation of an outdoor public art space incorporating a traditional Cowichan welcoming figure. Joan Gower Gillatt was a pioneer in our union. It took a special kind of courage and determination to lead those early fights for equality in the workplace. We can only imagine how many working women's lives were improved because of Joan's efforts and how many women activists she has influenced in the decades since. We acknowledge her important contributions to our union and women workers. Our condolences to her loved ones and friends.